Shaved Parmesan doesn’t work quite as well as shredded. A recipe that doesn’t involve beer?! I know, I’m in danger of becoming a well-rounded person. These are delicious, though, and very easy to make, and quickly becoming my go-to appetizer for guests. If you have access to Trader Joe’s, they sell a can of all-claw crab meat that’s perfect. Since I don’t, and I’m cheap, I just try to muddle through with the crappy store-brand can. Preheat oven to 375°F. Drain crab meat. Rinse mushrooms in cold water and de-stem. (I find it easiest to grab the stems as close as possible to the caps, then rock them gently side to side until they separate.) Finely dice stems and set aside about three-quarters for another recipe (pasta sauce, anyone?). Mix remaining stems, crab, Gorgonzola, olive oil, and pepper. Mix in bread crumbs until texture is right. You want to be able to form the mixture into balls that will hold their shape without crumbling. Pack mixture into mushroom caps, then top each with another heaping teaspoon. Lightly grease a 9×13″ baking dish and arrange the mushrooms, filling side up, so that they’re just touching one another (in case any decide to tip over). Bake until mushrooms give up water and begin to wrinkle, about 30-40 minutes. 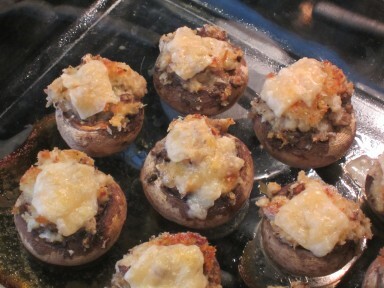 Sprinkle with Parmesan cheese and return to oven. Broil until tops are golden-brown, let cool 5 min, and serve.